The Strasburgeriaceae includes two monospecific genera, Ixerba and Strasburgeria. 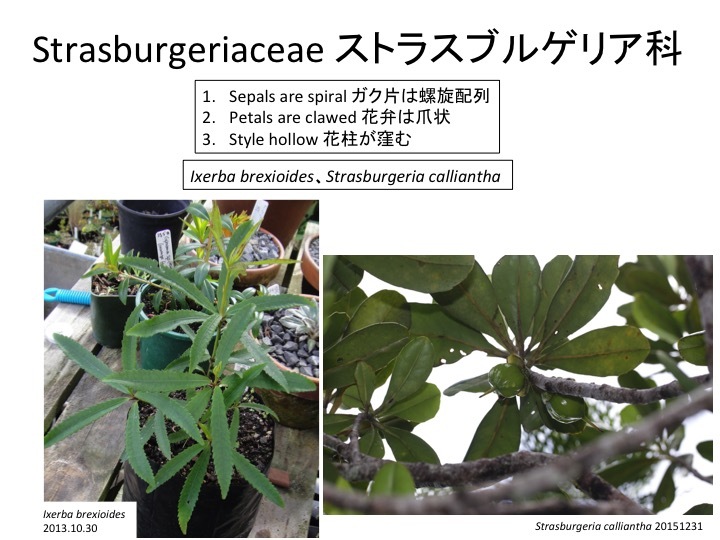 Ixerba brexioides and Strasburgeria calliantha are endemic in New Zealand and New Caledonia, respectively. Dickison, W.C. 2006. 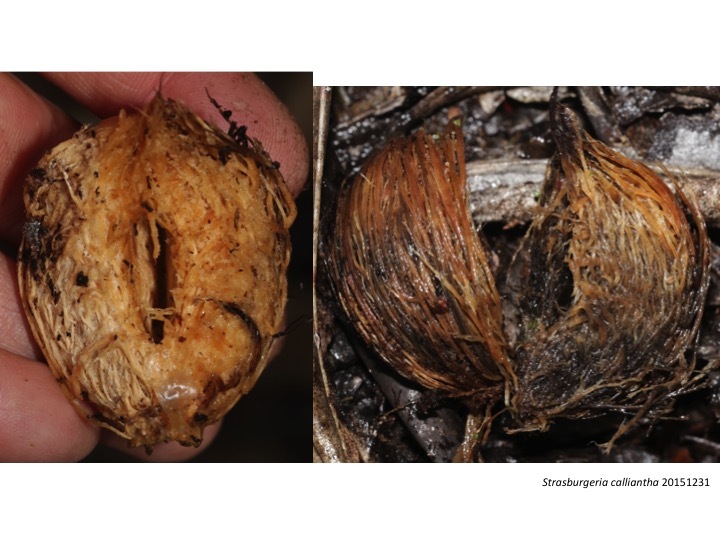 Strasburgeriaceae. In Kubitzki, K. ed. 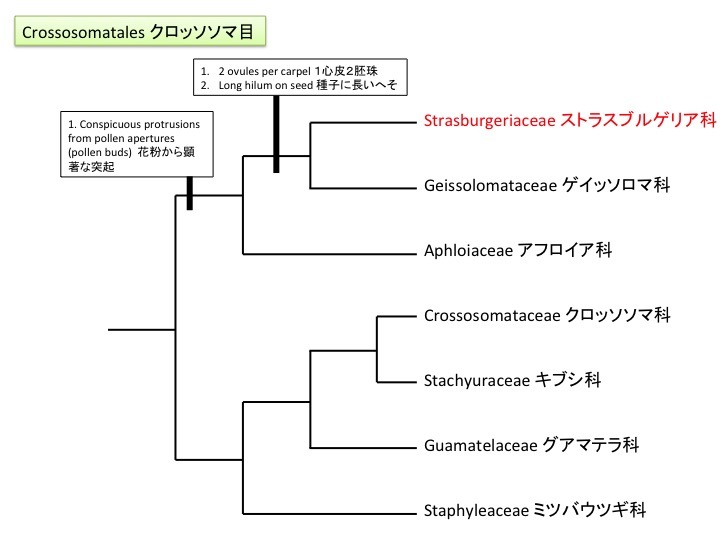 The Families and Genera of Vascular Plants IX. Pp. 446-448. Schneider, J.V. 2006. Ixerbaceae. In Kubitzki, K. ed. The Families and Genera of Vascular Plants IX. Pp. 205-207. 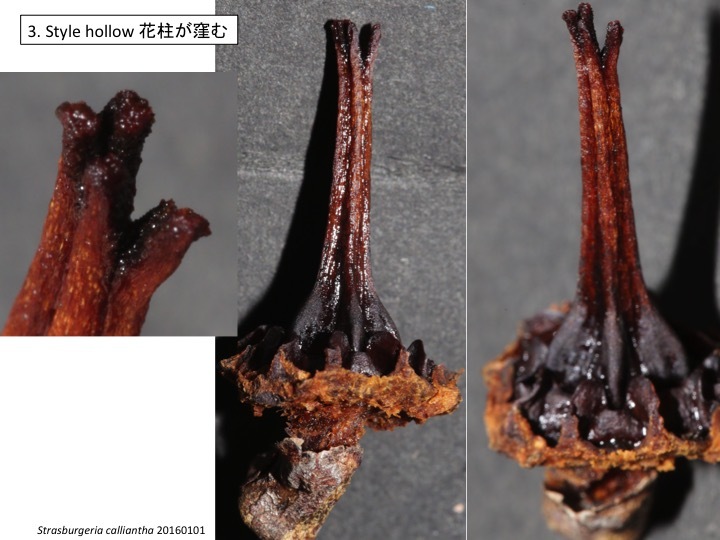 Four carpels are postgenitally fused. 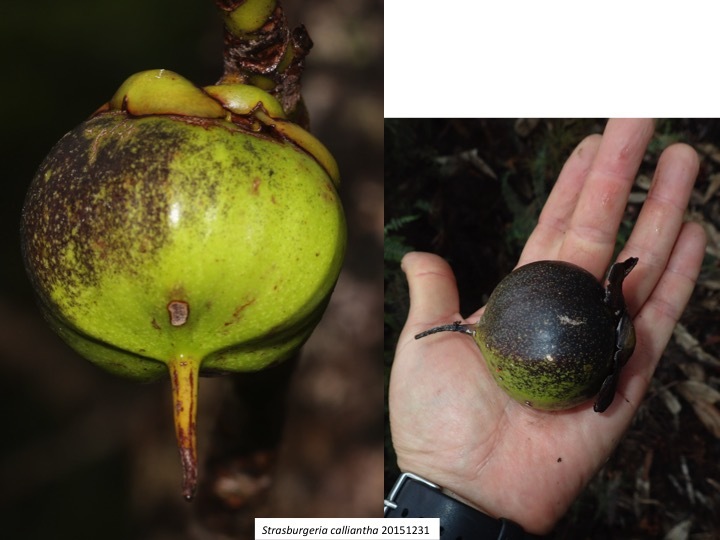 Strasburgeria calliantha forms a large fruit approximately 6 cm long with sweet smell similar to apple. 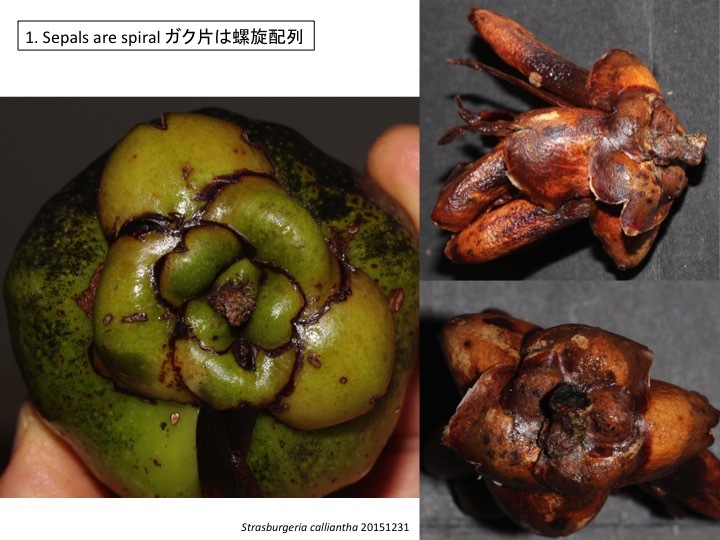 Fallen fruits are rotted and dehisced at the septicidal planes. 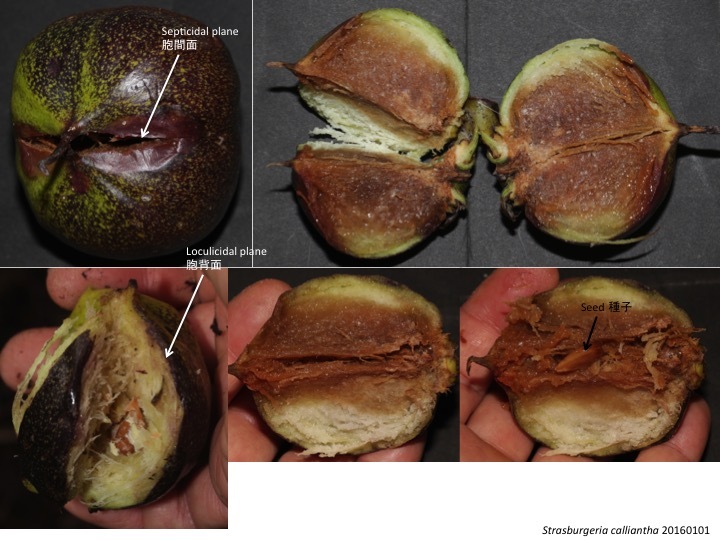 It is easy to break the fruit at the septicidal planes, but is very difficult to cut at the loculicidal parts even with a knife because of massive fibers originated from vasculatures. Seeds are possible to be picked from the inner ridge of the quadrant fruit. 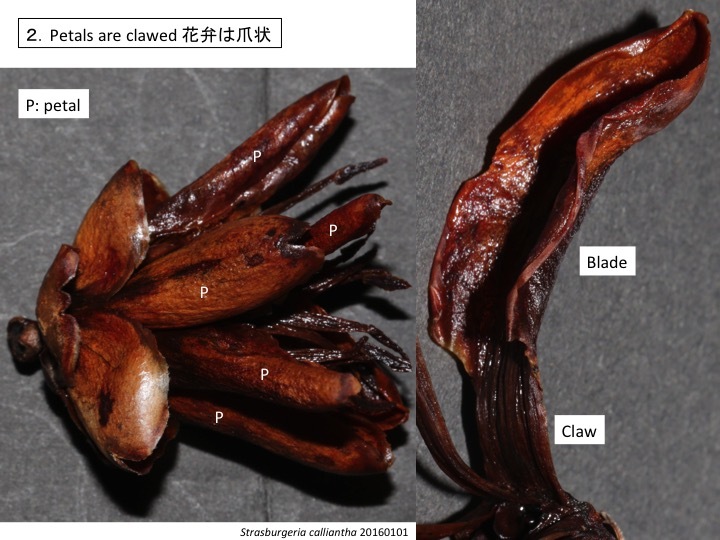 Epidermal and ground tissue of fruits are decayed but fibers remain more than one year. The decayed fruits are still very hard. Any seeds were not germinated in this locality. 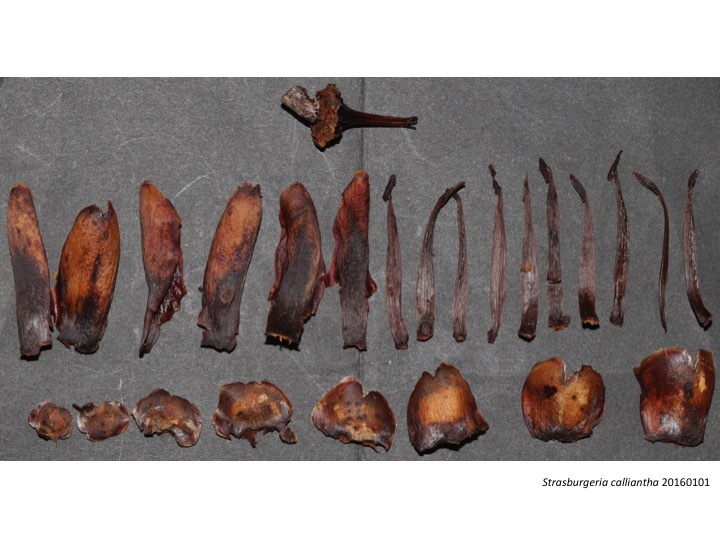 It is unknown why Strasburgeria form such large, sweet-smelled, and hard fruits. Carpenter et al. (2003) speculated that there were large mammals like gomphotheres (Janzen and Martin 1982) that ate the fruits and contributed to seed dispersal. Carpenter, R.J., Read, J., and Jaffré, T. 2003. 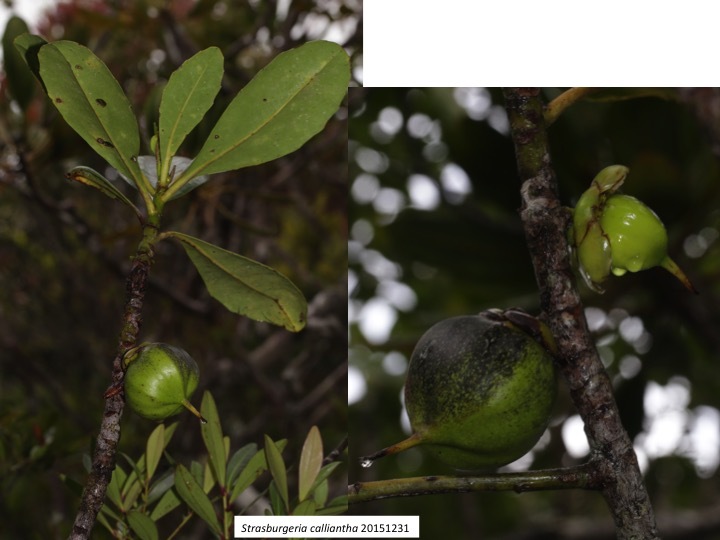 Reproductive traits of tropical rain-forest trees in New Caledonia. J. Tropical Ecol. 19: 351-365. Janzen, D.H., and Martin, P.S. (1982). Neotropical anachronisms: the fruits the gomphotheres ate. Science 215, 19-27.